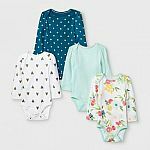 Carters / OshKosh has 40-70% Off Entire site. Plus get extra 20% Off $50+ Purchase with code "YAY20" (exclude doorbuster and clearance). Shipping is free on all orders.